We last checked in with Opelika, Alabama, as they began testing their FTTH network in a pilot project. The community previously overcame Charter Cable's campaign of lies and passed a referendum. Voters approved the plan for a $41 million fiber optic communications and smart grid network. The community has been constructing the network, expanding testing, and building a network hub facility. Still in “Testing Mode,” there is not a pin-pointed launch date for the fiber-optic network services. “But we’re getting close,” Owens said. She says that once operational, OPS will be able to offer lower rates than surrounding areas to the approximately 12,000 electric customers in Opelika. Once up and running full-speed, OPS will be competing with Charter, Dish and Direct-TV for Opelika customers. In the future, OPS will offer back-up data services to Opelika businesses. Mayor Gary Fuller spoke with Christopher for Episode #40 of the Broadband Bits podcast. They discussed the community's decision to take connectvity in their own hands after years of dissatisfaction with Charter Cable. We spoke with Opelika Mayor Gary Fuller in episode 40 of the Community Broadband Bits podcast and learned all about the community's FTTH project. Local residents and businesses decided to go beyond the substandard services they received from Charter Cable and build their own municipal network. 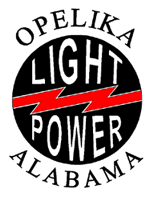 At the time of the interview, Opelika Power Services (OPS) was well into construction and is now testing the network, according to an article in the article in the Opelika-Auburn News. Steve Harmon, director of OPS, said there are between seven to eight test sites in the city that are basic residences receiving these services. Throughout the trial run, OPS will monitor what services are working efficiently and which ones have problems that need to be fixed. “We’re getting feedback from those people and we are working on fine-tuning the system’s channel configurations,” Harmon said. As this stage, test sites do not have telephone capability, which will be part of triple-play service from OPS. Harmon noted that service will not be offered until all issues are resolved. That being said, OPS expects launch to be in late spring or early summer. The community faced one of Charter's misinformation campaigns, but citizens still approved a referendum to bond $41 million for the network and smart grid project. Since then, Opelika has moved forward steadily with network construction and construction of a network hub facility.